At pressing and stamping lines the burr damages the tools and the rolls. To eliminate the burr, a strip edging machine is integrated into the line. The edge is cleaned and the strip width tolerances are improved. The swarfs are removed by different swarf removal systems. 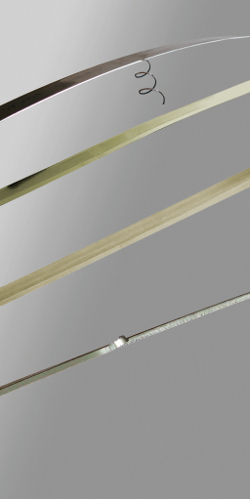 Mostly a deburring device of the series UNO is integrated into a pressing line treating the strip edges with one tool at each side. For a lot of production processes, such as the treatment of the strip edges or the strip surface, the strip has to be flat and straight. Coil set and waviness have to be dressed to guarantee a good performance of the further production processes. 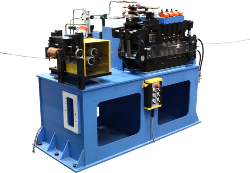 The flat levelling machine of the series DRAP is designed for vertical levelling of wound strip material. The levelling machine reduces waviness and eliminates coil set.